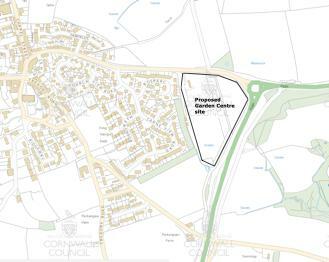 At a Probus Parish Council meeting in April 2015, Mr David Danning from Trelawney Garden Centre, confirmed that they were in a position to proceed with the building of the long-awaited garden centre near the Trewithen roundabout. Trelawney has sold its garden centre in Barnstaple and now has the capital to build the Probus site. The other Trelawney site at Wadebridge has been leased to Blue Diamond, a national company. Trelawney will develop the Probus site, including the Demonstration Gardens, and will lease the garden centre business to Blue Diamond. The advantage of joining with Blue Diamond is the development will be built all in one go, rather than bit by bit as previously planned. A new planning application was submitted in August. The application incorporated a revised scheme with a u-shaped building with a solid roof, the centre of the ‘u’ will be glazed over for seasonal plants. The site will also incorporate giftware, clothing and kitchenware. Clearing of the site has started, in consultation with the Council's Tree Officer. Mr Danning had hoped that the centre would be open by the middle of 2016. It will create about 100 full time equivalent jobs. Consultation was held with local residents whose properties back on to the site to agree issues such as screening of the site. It is planned to make improvements to the road outside the site including providing a pavement running towards Carne View. Unfortunately, it became apparent in November that certain conditions that would have to be met before the application could be determined had not been met. There are issues with carrying out a bat survey and with the proposals for which trees would be retained, screening etc. The applicant decided in early December to withdraw the current application. Further work will be carried out in the spring and a new planning application will be submitted then. The centre will, therefore, not be open for several months. Watch this space.